The tires he was using are 1.8in super swamper tires. Very cool rock crawler. As I had some interest in RC cars a couple of years ago, I still watch many RC video's especially crawlers and buggy's. It is very light weight, powerful and has lot's of grip with the special tires. It works great on the rocks. It is a very good design. I certainly am glad you are building JJ2's Super Crawler. It seems like a lot of fun to build and drive! I have been rather busy lately and because of that and my lack of skill when it comes to building in LDD, I have not yet completed the LXF file. I will work on it tonight and hopefully complete at the very least an axle or so. The tires are labeled as being 1.9 inches, but in reality the inner ring of the tire is actually about 1.8 inches for a tighter grip on the rim. Lets say...definitely by the end of monday, maybe even earlier. I'm not entirely sure if I linked the file correctly, so let me know if there are any problems with it. Get ready for a whole lot of confusing language! 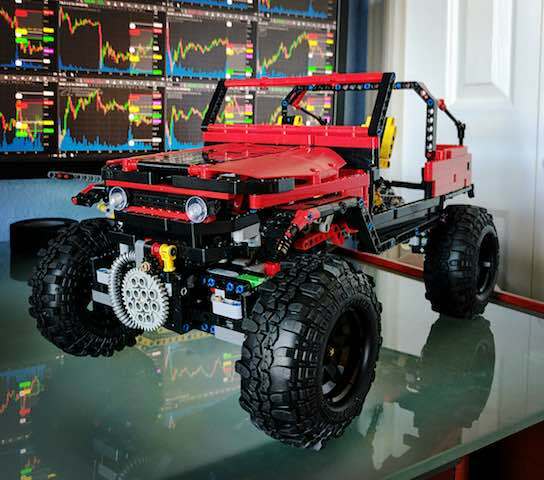 -The tires and rims are not included. 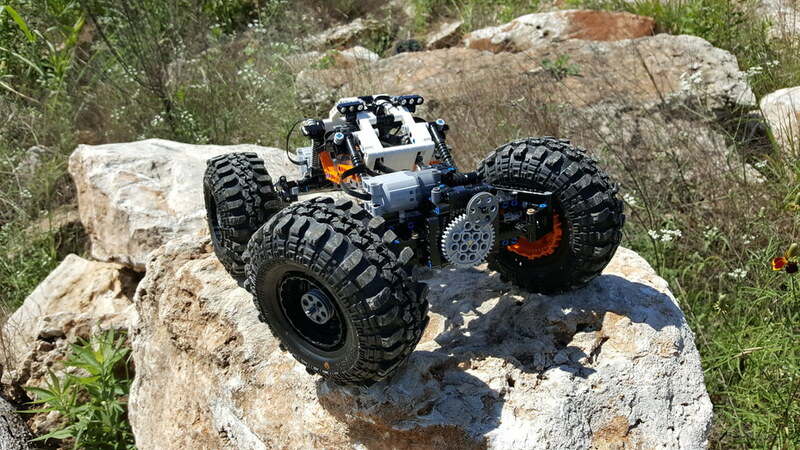 I used the black 9398 rims with 1.9" RC4WD Super Swamper 3rd party tires. -The cab is not connected to the axles with the links nor the shocks. -The shocks in the LXF file are yellow whereas the shocks used in the actual model are completely black as they are the 11L soft shocks. -The LiPo battery is also not in the LXF, it gets placed somewhat diagonally in the front of the cab. See pictures for reference. -The red bar going vertically through the center of the cab is what keeps the LiPo battery in place, use the 3L pins at the top of the cabin to hold the bar in place and therefore lock the battery within the chassis. -The silver 88m hoses are not placed on the model but rather within the file. See pictures to for reference. -The black 5L beam with the black 2L beam in the center goes on top of the two black pieces that connect to the two upper links of the front axle. 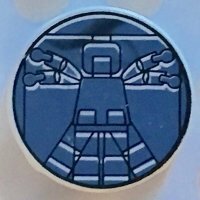 If there are oddly colored pieces or moments when building that you say, "Why did he use this piece rather than this one? ", the answer will usually be because of limitations of Lego Digital Designer and the incomplete array of technic pieces the software has. Let me know of any comments or suggestions on the crawler, I am open to new ideas! It's all happening today! Again, thank you - straight on the To Do list. It's very late here so I'll only be able to have a look tomorrow. Enjoy the remainder of your weekend. Here is a video of my Chilli Crawler at Carl Schurz Park in New York City. It's been a slow month, but I got another video out, so here it is and enjoy! P.S. For future reference, is it "OK" for me to bump one of my relatively old threads? great scenery and I like the attempts put in there to show oh hard is it to drive one of these without flipping it. From what I can tell you can bump your topics whenever you want unless its just "thanks" for a really old comment or some just bumping the topic to get it back on page 1. This is next on my To Do list. I finally finished JJ2's Super Crawler 2, but work has been hectic. I get a message saying that the video is not available. Your other videos appear to work, though. Not to be weird, but do you happen to live in Germany? as youtube told me when posting it that it would not be available in Germany due to copyright issues. Sorry for the issues with the video, hopefully it will be resolved and become available later. No, England, which is now a profound step further away from Germany (and the rest of Europe for that matter). Odd that your other videos work. Oh, well, great opening shot of it perched on the rock! Haha thanks, and I now realize that I could have just looked at where it said UK, oh well! Just finish the build, awesome articulation and torque. 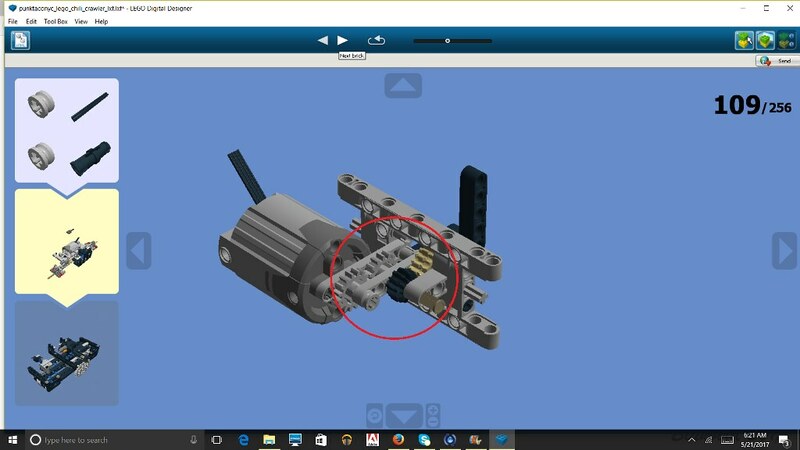 One question on the steering, how do you prevent over steering since it's a regular motor, do you have to set up some limit in Sbrick? Um, haha, well, uh, no. I did not set any sort of limit to prevent oversteer. I rely upon my primal instinct to guess when I should stop turning. Sorry! Besides that, however, I am very impressed by your build. That body makes a great addition! Those super swampers.......are those 1.9 or 2.2 ? - Changed the color scheme. Orange, black and white. - Buwizz for power and control. I wasn't really surprised by the performance, which is terrific, because I thought it would be. The videos by the original builder are just fantastic. What I am surprised about however, is the durability. My version took its fair share of spills, falls, etc and really, relatively nothing broke or failed. Couple of the links get pulled out from time to time, but that is about it. I even have a crack in one of the U-joints in the front axle, but it is so well braced that I haven't even bothered changing it out. It really only skips in the most dire of situations. I hope to make a video soon. Videos can be hard for me as my kids spurn helping dad and his "geeky" projects. If I get my wife to help tape then well..... I have a whole weeks list of things to do to compensate..... We go on a trip here shortly but hope to get something done when we return. - I am a OCD about friction. I think this arose from oven TLG warning of friction in their instructions and my building experience as a kid. Now, as an adult, I test my models through the whole building process for friction. If the infamous 42056 taught us anything it was the perils that can arise from too much friction. On step 109 I wondered if the thin 5L lift arm was needed. I get why it is there.... for bracing, but I hypothesized that it would not be needed. This was important b/c when testing the model at this point in the build the (w/o the motor) things were very difficult to turn. Tons of friction. Mostly due to the thin liftarm being flush with both beveled gears. So, I eliminated this lift arm - and .... no problems. No skipping of the gears, etc. This allows much more power to the front wheels. Which is needed because the 2.2 tires with rims are hefty and difficult to turn. 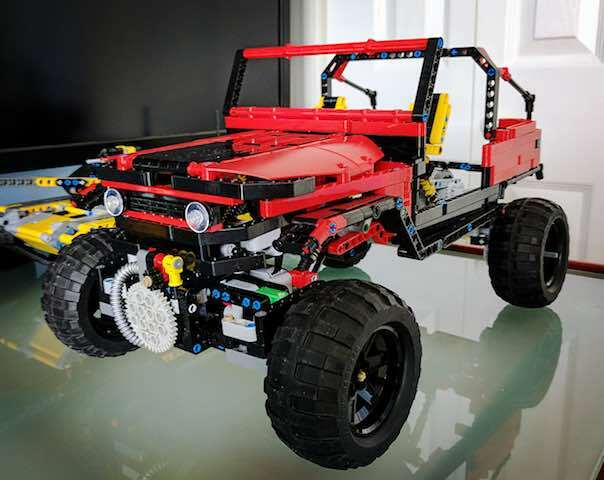 - Lego RC vehicles are fun to built, but honestly I have never really had much fun driving one. Perhaps that is because I have several real RC, brushless cars so the performance is not comparable. But, I truly have fun driving this crawler. Crawling is a different style of driving, much more about calculating and planning where to put your tires, power to add, etc. but this little guy is quite a bit of fun. - Buwizz can add alot of fun to not just vehicles built for speed, but also those that need power. Great for truck trials and speeded vehicles alike. Like I said, I will try to get a video soon. But hats-off to PTNYC for this build and for making the instructions. Had a lot of fun building this MOC and have even more driving it. Finally got around to completing a video for this build. I hope it does the model justice in terms of demonstrating the amount of fun I had building and driving it. 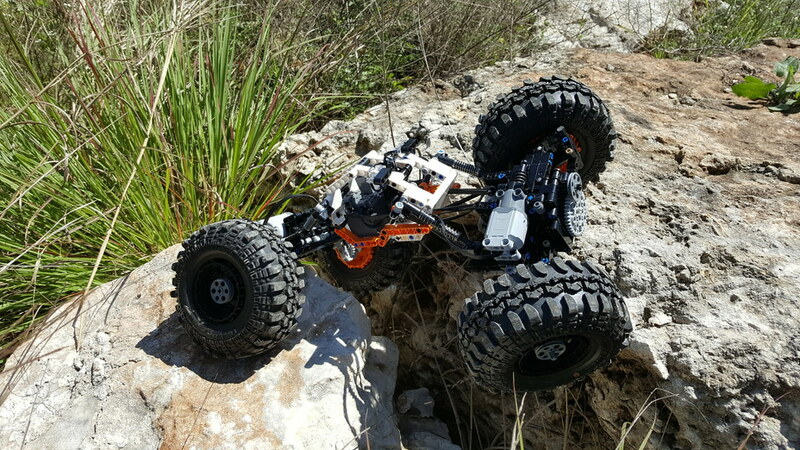 Seriously a great crawler..... the rock you see in the video that this crawler can scale is just under 12 inches tall. Wow. This certainly came as a surprise, but a welcome one. Thanks for your kind words nerdsforprez and I am intrigued by your idea about the 5l liftarm. So, by removing it, it leaves the 14t gear connected directly to the motor unbraced on one side, right? And if so, have you had any issues with it coming out on its own or grinding at all? 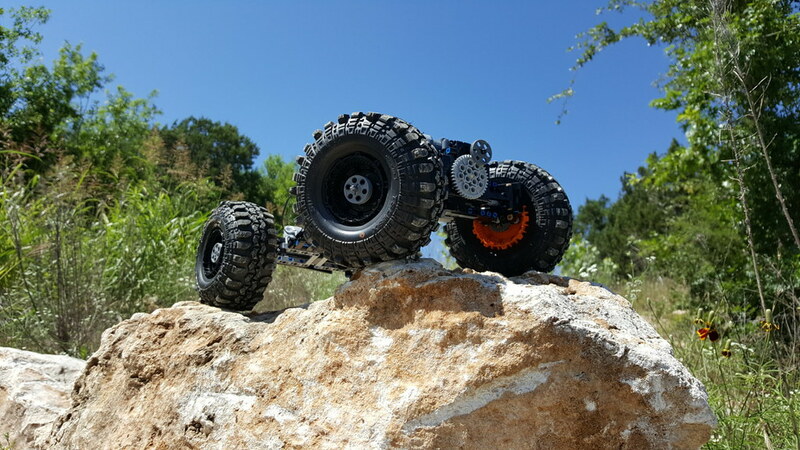 Your color scheme looks stellar and your rim/tire combination gives it a closer resemblance to competition RC crawlers. The BuWizz appears to be an improvement over the SBrick and 8878 battery box combo, I may have to invest in one. Thank you for giving credit where it was due. P.S. 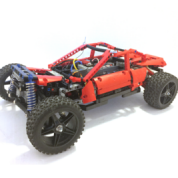 I am currently working on another crawler of a slightly smaller size with performance that rivals that of my Chilli Crawler. Hopefully, the video will be out sometime over the summer. Well, the 16T gear is still braced.... if you move ahead to step 170 you will see that the 6L axle goes through the 2 thin 6L liftarms and the connector. I just replaced the 5L liftarm with another 1/2 bush.... so...... 3 1/2 bushes in total for that part of the build.